Thanksgiving Week Extravaganza #5: CAKE! What would Thanksgiving be without dessert (or any holiday for that matter)? I’ve created so many pies for the blog (Vegan Gluten Free Pumpkin Pie, Pumpkin Spiced Apple Pie, Peanut Butter Cup Pie, Chocolate Peanut Butter Mousse Pie, Chocolate Silk Pie, etc.) that I figured it was due time for an alternative. This recipe requires just 1 bowl! Yes, it’s that easy. The cake is a moist, pumpkin sheet cake adapted from my 1 Bowl Vegan Pumpkin Bread, meaning this cake is both vegan and gluten free! The filling is a mash up of coconut whipped cream and vegan cream cheese! It’s so insanely fluffy and creamy and sweet with a slight tang. 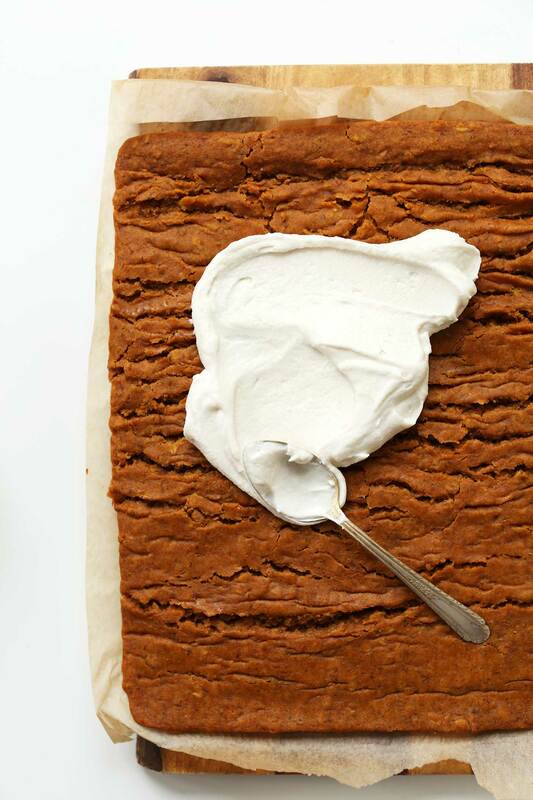 In other words, it’s the perfect filling for this dreamy pumpkin cake. Enjoy this roll at Thanksgiving and beyond. It would make be the perfect cake for hosting, fall gatherings and holidays. Make it ahead of time and slice and serve, and watch as your friends are ‘wowed’ by the flavor and your jedi cake rolling skills. 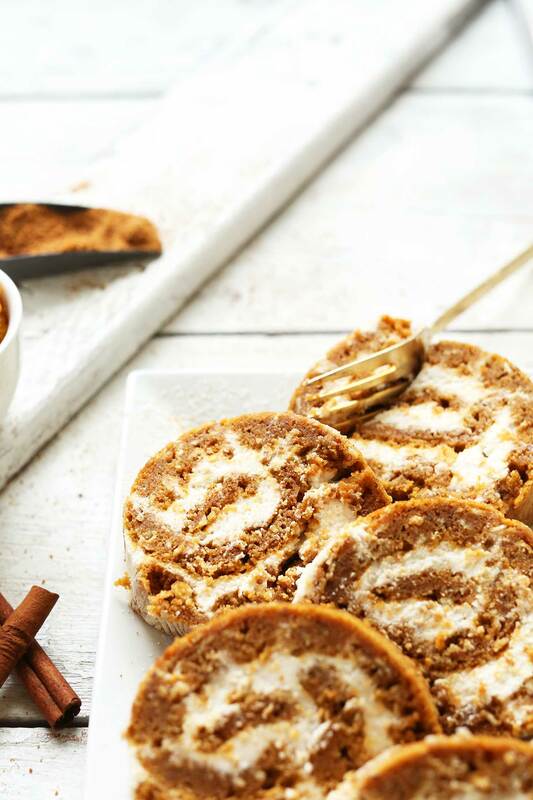 Amazingly moist, flavorful, pumpkin roll that's made in one bowl and entirely vegan and gluten free! The perfect plant-based dessert for the holiday season. Preheat oven to 350 degrees F (176 C) and line an 11x17-inch baking sheet with parchment paper, making sure the edges are completely covered. It's important to use a baking sheet that's close to these dimensions or the cake will be too thick or thin to roll (amount as original recipe is written // adjust size/number of baking sheets if altering batch size). 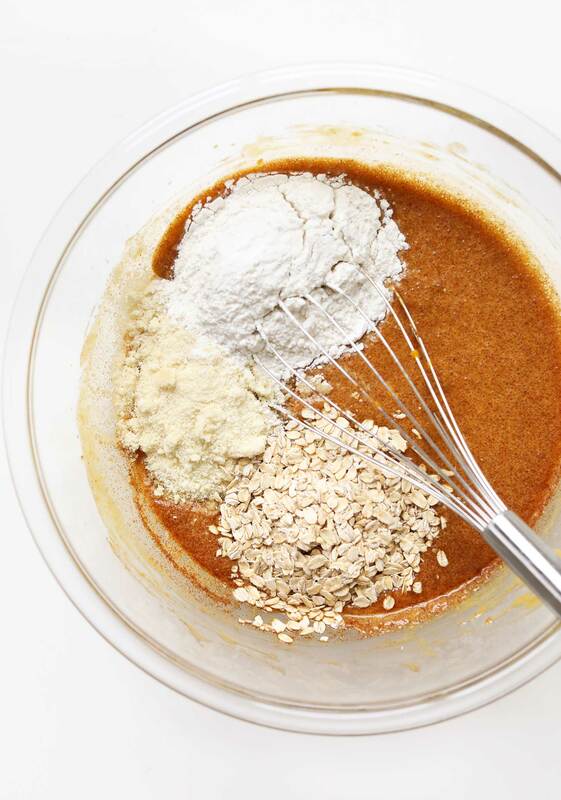 Add almond flour, gluten-free oats, and gluten-free flour blend, and stir until just combined (see photo). The batter should be thick and pourable. Taste and adjust flavor as needed, adding more pumpkin pie spice for pumpkin flavor, or muscovado sugar for sweetness. While the cake is cooling, quickly rinse your mixing bowl and add your chilled coconut cream. Whip using a hand mixer or whisk attachment until light and fluffy. Then sweeten to taste with powdered sugar. This should yield about 1 1/2 cups coconut whipped cream (amount as original recipe is written // adjust if altering batch size). Next, add vegan cream cheese and beat to combine. Then add more organic powdered sugar to taste. I added another 1/4 cup (32 g) total (amount as original recipe is written // adjust if altering batch size). Cover and place in the refrigerator to chill. Very carefully begin rolling the cake back up the same way it was unrolled - from short end to short end - removing the parchment paper as you go (you don't want it inside the cake). Some filling will likely spill over when rolling - that's OK. Continue rolling, using the parchment paper as a guide until the cake is seam side down. Wipe away any excess filling that may have spilled over. Next gently roll/wrap the cake in plastic wrap and carefully transfer to a rectangular dish or cutting board and refrigerate until completely chilled and firm enough to handle easily - about 6 hours. To slice, carefully unroll from the plastic wrap and place on a serving dish. Then use a serrated knife (wiping it clean each slice) to carefully slice the roll into about 10 pieces (amount as original recipe is written // adjust if altering batch size). Enjoy as is, or dust with a bit of powdered sugar. *If you don't have a can of chickpeas for the aquafaba, you can try subbing egg replacer or 2 flax eggs, though I haven't tested the recipe that way and can't guarantee the results. *Prep time reflects making, cooling, and rolling the cake, as well as chilling. *Nutrition information is a rough estimate calculated using 1/2 cup (64 g) powdered sugar per 10 slices. *Method adapted from Gimme Some Oven! I followed every step with the exact ingredients and it was only about 3/8″ tall after baking and cooling. I came to the filling part and my roll fell apart as well, but also seemed gummy. Hard to tell if it was done because I did do the fingertip test. There were too many cracks for me to add the filling so I took small pieces out and placed them in the tiny muffin pan to bake into tiny crusts. The rest I dumped on the pan broke it up and baked it into a crunchy crumble. My filling really did not set up as cheesecake filling either. So I filled the mini cups after they had baked and cooled and sprinkled the crunchy pieces on top. Flavors were nice but I won’t attempt this again. Hmm, sorry you had trouble, Patti! Roll cakes can definitely be tricky. Not sure what went wrong! I decided to make this yesterday for thanksgiving and followed the recipe from A to Z except i didn’t have luck making the coconut wiped creme from either a trader joe’s brand organic coconut creme (left in fridge for 6 hours, when it was time to whip ut was too hard and just wasn’t getting creamy) or whole foods full fat coconut milk (too runny) so i ended up buying a pre-made So Delicious brand whipped cream, which worked like a charm. However when it was time to unroll the cake it all feel apart!! Couldn’t save it no matter how hard i tried. So i ended up serving something else and left the scraps and just ate it today with a dollop of filing in top. It tastes amazing, i just don’t know why it feel apart. Any ideas? Thanks for the recipe! Hmm, hard to say. I have never worked with the So Delicious brand whipped cream. That might’ve been the culprit? It’s also a tender cake and just needs to be handled gently. Never got to that step. As i said previously, the cake fell apart after it cooled down and i unrolled it to fill it. I have made pumpkin rolls before and i am always gentle with the rolling process. But this cake just completely came apart, in chunks. It’s a shame because it is a really good tasting cake! I made pumpkin roll last night and today was delicious. Moist, sweet enough but not over powering with sugar and added oats put an extra flavor and texture. Libby’s recipe was substituted by this vegan roll. Even non vegans enjoyed it. Thank you😋. Yay! Thanks for sharing your experience. So glad you and your guests enjoyed it. Next time would you mind leaving a rating with your review?! It’s super helpful for us and other readers. xo! My daughter is 11.. I haven’t had a pumpkin roll since she was diagnosed with multiple food allergies at 1.. thank you for your amazing recipe!!! We can’t do almonds so I used gf oat flour and gf al purpose flour. So soft and fluffy! Yay! Thanks for sharing, Kathy. So glad you all enjoyed it. Next time would you mind leaving a rating with your review?! It’s super helpful for us and other readers. xo! I have made this twice now and it was amazing! I used regular AP flour for both the almond flour and GF flour blend and it turned out lovely. What I learned from the first go-round was that the extra 2 Tbsp mentioned in the very last list item are helpful for the texture, and to bake for 22 minutes instead of 20, as it was still very soft the first time, but still rolled up nicely. I would also go on the heavy side with the powdered sugar to make sure the cream filling becomes thick and fluffy as I think it helps to give the rolled cake more to “hold onto” if you will to help keep its shape even after it starts to warm up when you remove it from the fridge for serving. I dusted the top with some powdered sugar before serving and it was divine. I’d also love to find vegan white chocolate chips somewhere to press into the surface of the finished, rolled cake for even more sweetness and some satisfying texture! Thanks Dana, as always, for a great recipe! Hi there! I’m not vegan or GF, but I do like making healthier recipes which is why I’m planning to make this :-) Can I substitute an egg instead of the aquafaba? Is one egg enough for the 1/3 cup of aquafaba? Will the icing taste like coconut at all? 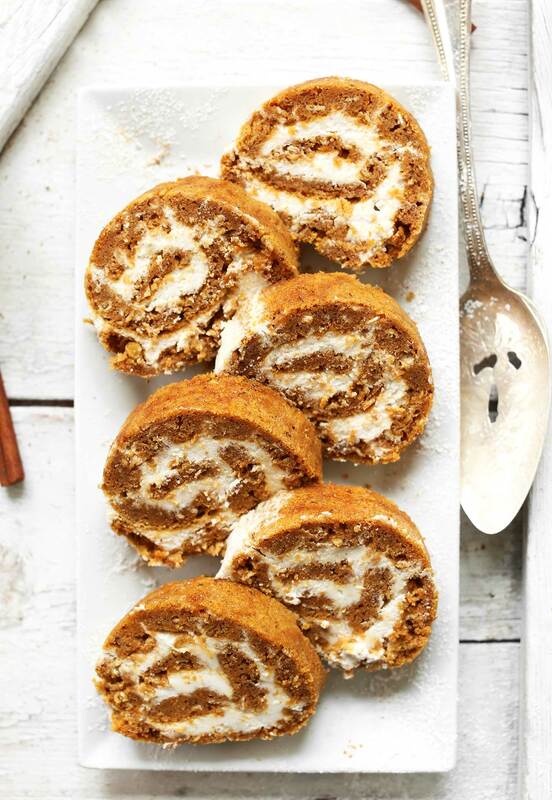 I have to make these for a fundraiser and I need them to taste as much like normal pumpkin rolls as possible. I don’t want people to then to be able to tell they are eating vegan treats. Hi Emmy! If you’re concerned with having coconut flavor, you could just try and do two containers cream cheese instead. Adjust sweetness as needed. It will be more dense, but still delicious! Amazing. Decadent. Delicious. Perfect for everybody, not only those with special dietary needs. This was met with resounding approval from my kids and my husband. I call that a win! What would you substitute? Applesauce? Hi Skye! Applesauce would probably be a good sub. Good luck! I made this cake roll for Thanksgiving. The cake part turned out lovely, but I have no idea what’s going on with the filling part of this recipe. I bought coconut cream in the size can exactly as specified, vegan cream cheese, and all other ingredients exactly as directed. The whipped coconut cream was runny and I did not see how this could possibly result in a decent filling. Why in the world don’t you use your vegan cream cheese frosting recipe for the filling? I had to go to the store on Thanksgiving day to try to find more vegan cream cheese to thicken the filling. Could not find it, and I had to make do with the addition of Earth Balance and additional powdered sugar. It was ok. You should really explain how a can of coconut cream can turn into anything resembling whipped cream. You did not specify a brand of coconut cream. Not a good experience! Hi there. I just made the pumpkin roll last night so it’s all fresh in my mind. Thought I would answer your question about the coconut cream filling. I personally bought the organic coconut milk from wholefoods which is in a white can with a line of green at the top. This is the full fat one not the one that says light coconut milk which is all liquid. I have also purchased the green small can before that says oragnic coconut cream premium…again from wholefoods. Of note, Trader Joe’s also has full fat coconut milk in a can. Oh and when u hold a can in ur hand and shake it a little you can tell which is the liquid one and which is more thick. I put 2 cans in the fridge for a day but im sure a few hours would work too. When u open the can u will see that all the fat is at the top and the liquid is separated at the bottom. You scoop out the fat and when u whip that it def does look like whipped cream. I then added the vanilla and powdered sugar to taste because I personally don’t like things too sweet. (I only added 1/4 cup). After the whipped cream adding the cream cheese thickens it up more. It turns out great. I could see how it wouldn’t thicken if you purchased coconut milk without the full fat. I would be happy to send you an image of the 2 coconut milks if that would help you try the recipe again. I will share the outcome of the dessert tonight as it is currently in the fridge. Hope this was helpful. I used regular flour along with the oats and almond flour and it turned out amazing! It rolled without cracking, it smells divine and the filling is rich, creamy and perfect for it!! I love this recipe!! I replaced the almond flour with Trader Joe’s Almond meal that I ran through the Vitamix real quick and it came out great! Can you use ONLY AP flour and omit the oats, GF flour and almond meal? ugh this is always tastes SO GOOD but it always looks like a pumpkin mess. it always breaks up when i’m rolling it up! I can’t have oats, do you have a substitution for that? Hi! You could try ground flax, or quinoa flakes! Hi, Is there a way to add a design on the outer roll area? Thank you. Hi Sarah! What a neat idea, we haven’t tried it, but if you do please let us know how it turns out! We would love to know if it works! Would it work just as well to leave the vegan cream cheese out of the spread? If not, can you please recommend a non-cheese sub for it? Thank you! Strong baking soda after taste? can you cut back on the baking soda and still get same fluffy texture? Otherwise great recipe! 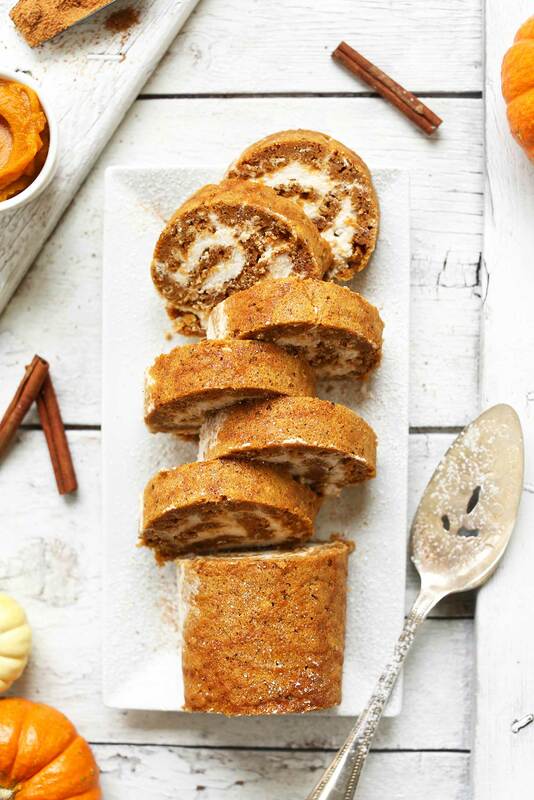 I keep seeing the Little Debbie pumpkin rolls at the grocery store and have been wistfully wondering if I could make a vegan version~~and then suddenly your recipe appeared in a list of vegan fall treats via Yahoo, so yayyyyyy!! Gonna make this as soon as I can gather up all the ingredients! (just so happened to have a container of Daiya cream cheese in the fridge just waiting to be used for something wonderful) Thank you! Looks yummy except “gluten-free flour blend” is not described in detail. ground garbanzo and flax seed flour? Hi Al! This is our recipe, you could also get gluten free flour at the store as well, just ask someone who works there! Oh man, I messed this up pretty bad…. I forgot the water and it fell apart. Question: do you add xanthan gum and how long does the filling need to chill? No xanthan gum in this recipe, Sol! Hi! Did you let it cool long enough? That may have been the issue! This cake has a very outstanding flavor! It’s hard to resist eating more than one serving! Wasn’t sure if this cake would turn out. The filling turned out too runny, and when I tried to re-roll the cake with the filling, the cake cracked and broke. I was happy to see after chilling , it had set quite nicely and sliced well. I will definitely make this again! Might change up the filling a bit by using vegan butter instead of coconut cream. Thanks for the recipe! I made this with Bob’s red mill all-purpose gluten-free flour. I think the garbanzo bean flour in this mix gives it a gritty texture. The roll was tasty but I’d like to try Dana’s GF flour mix if I made it again. Hi Dana! I want to use this recipe to make a Buche de Noel cake for my family and I was wondering.. if I add chocolate to the recipe and omit the spices, will it come out like a chocolate cake? I was going to use your other gf choc cake recipe, but I feel like this one is more “workable ” and easy to roll. What do you think? Can I edit this recipe to make a chocolate roll cake or should I just stick to your other gf/v choc cake recipes? Thanks so much and I hope to hear back from you soon! Maybe a mix of oat flour and more GF blend? Quick question: there is an asterisk on “pumpkin spice”, but I don’t see an asterisk note corresponding to it. Is there a specific pumpkin spice blend to buy? Fixed! I added a link in the notes. Otherwise I get mine from Trader’s! Okay SO I rarely follow other people’s recipes, and when I do, I sub ingredients. But since I made this for a work party for others, I truly followed this recipe TO A T and it came out aaaaamazing!! Some notes: I did not have a whisk for the aquafaba, just a fork for this cake batter part, and it came out just fine. I also didn’t have a fancy beater for the coconut whip – I used a kitchenaid handblender and this also came out amazing. There ends up being a little more cream cheese icing than needed for the roll, actually (more for me! :p). I got 12 slices out of this. Only thing I would change if doing this again is…instead of unrolling the cake, icing it, rolling it back up, then transferring it to plastic wrap to wrap tightly… I would unroll the cake, place THAT flat cake on plastic wrap, then ice/roll/wrap. I had a really hard time with just two hands to keep the roll tight but not drop anything once it’s all rolled up with icing and heavy. It would have been much easier before the icing was added if the plastic wrap was in place. Or if I had a second set of hands haha! I brought this to work with a bunch of skeptical non-vegans (“how can you make cream cheese icing vegan?”), and they reeeally loved it!! The cake is so moist and the icing is dangerously addictive. An great recipe I will remember for future occasions. I made this for our Thanksgiving feast (we had 2 vegans attending) and it was so gosh darn good! This is going to be our staple for every Thanksgiving now. I used regular flour though since I didn’t have GF flour laying around but I did have everything else. It all worked out beautifully. I was a vegan from 2001 – 2006 which brought me to be an aspiring baker/chef since there wasn’t much out there for me at the time. I had to get creative. Revisiting this (and making my first roll cake! hollah!) made me miss what brought me to my life today. Thanks so much for this. Your recipes are heavenly and I can’t wait to try more. I’d love to morph this into a tiramisu dessert. Instead of pumpkin use a combo on espresso, cacoa and maybe more banana? sprinkle chocolate chips ontop of the cream? any ideas are appreciated as I need to make it this weekend!! I made this for Thanksgiving and it was AMAZING! I used AP flour instead of the GF mix but used the almond flour and the oats as stated in the recipe. At first I wasn’t sure about the filling but it turned out delicious. The taste reminded me of the Little Debbie Oatmeal Cream Pies but so much better. Thank you for sharing this recipe! Hi Dana, I have a question about the frosting – I used 1 can full fat coconut milk and one 8oz container of vegan cream cheese plus the powdered sugar and mixed just like you said. Mine turned out very runny, creamy but too thin to be a frosting. Any suggestions for next time? Not sure what I did wrong? Thank you! Hi Jare! Did you whip the coconut milk into whipped cream first? Hi! If you buy a can of coconut cream and whip it, you can slowly add in some of the non cream portion back in to thin it out a little. Hope that helps! Rolling it up went beautifully until about 2 inches before the end, the cake split. So it didn’t look quite so nice as yours. But tastes heavenly! Only problem is eating too much at one sitting. Yum! I made this yesterday for Thanksgiving, and it was soooo delicious! I don’t have much success with gluten free and vegan desserts but this one was an exception. No one could tell it was gf or vegan. For the filling, I used storebought so delicious brand coco whip which is the vegan version of cool whip, instead of coconut whipped cream. It worked PERFECTLY and really helped cut down on time! I made this for thanksgiving last night and it was such a hit!! Really delicious and creamy. Best of all, easy to make! Thank you so much! For Thanksgiving I am thankful for you and your recipes, Dana! I made this last night for friendsgiving and it was SO good! I used ap flour and also put a bit of vanilla in the icing. Worked perfectly! I made this for Thanksgiving today and it was a hit!! I used dark brown sugar instead of muscovado sugar. I didn’t have time to chill my coconut cream cans, so I whipped everything together for the frosting and put it in the fridge while the cake cooled to room temperature, and that worked out just fine. Also, I added a ½ tsp of orange extract to the frosting and OMG it gave the flavor a subtle extra brightness that was amazing! I definitely appreciate the warning to be really careful and mindful while rolling the cake, because it falls apart easily if you aren’t. This recipe is definitely a keeper. Thank you! Me too… I rolled up the cake to let it cool with no issue, but when I unrolled it to add the topping, it had broken across. I added the topping and rolled up the best I could, plastic wrapped it and set in fridge. I think this is going to be a very messy pumpkin roll :-) I used real pumpkin and maybe that is the issue with the cake. I’ll come back with a rating after I try a piece (breakfast tomorrow). Well, it was very tasty regardless of having a broken cake! I loved the pumpkin cake. I didn’t make the filling very sweet and for me, that worked well (I am not into super sweet breakfasts). Thanks Dana! Ok after letting them chill all afternoon (6+ hours) I cut into them. While they are delicious, there can be no way that the filling in the images is the recipe listed. I followed the directions even down to the brands used. It just does not have that type of density! Your picture looks like real cream cheese frosting and mine looks like a sad vegan version :( The majority of mine apparently squeezed out during the rolling process so that there is only a super super thin layer. Right now it’s too late – – but is there any way to the filling more “thickness” so it isn’t so runny? This was super easy to make! I may have lucked out and put just enough of the whip where it didn’t explode and it looks nice, only used about 3/4th of the filling. I can’t wait to bite into it! It’s resting in the fridge now for turkey day. What can I sub for the coconut whipped cream? My daughter is allergic to coconut. Hi there, Jenn! You could just try and do two containers cream cheese instead. Adjust sweetness as needed. It will be more dense, but still delicious! This is awesome. It only had 30 mins to rest before I sliced into it! I used spelt flour, Daiya cream cheese (cause I can’t find any other brand) and I used a no salt added can of Chick peas for the aquafaba. I first heard about aquafaba this summer in Toronto – it was star of the show at the vegan bake-off held by Toronto Vegetarian Assoc. This will be on my list of holiday recipes for sure! I am going to try freezing it so I don’t have to eat it all in 48hrs. Should be like one of those old Pepperidge Farm layer cakes except fabulously vegan. Thanks Minimalist Baker… again! This looks INSANE. Would LOVE to try making it for my Thanksgiving feast!! This looks amazing, but I don’t do bananas. And suggestions for banana substitution? Hi there! Applesauce would probably be a good sub. Good luck! Hey Dana- have you made this with simple flour? No oats, pastry flour, almond flour, gf flour?? Hi there! I haven’t, but I think that would work! Let me know if you give it a try. Do you reduce your aqua faba before using it or just use it directly from the can? This looks fantastic, but I may need to experiment using mashed apples because I am severely allergic to bananas. Being allergic to almonds, what would work as an alternative to almond flour? I have always wondered if it needs to by whipped first as well (the aquafaba) some of us who are newbs need to have things clearly spelled out, like me. It would be most helpful. Thank you. Of all the recipes I see that use aquafaba, none of them ever say whether it should be sodium free or not. I was wondering about that because you would not want salty whipped topping. I was perturbed by this as well, until I realized I can either omit or cut down drastically the additional salt. I don’t really understand the aquafaba ingredient – chickpea liquid is as effective as eggs? I’m just nervous about that! Why would that be? The starch and the protein in the liquid acts as an egg in most recipes! Read more about it here. Thanks – I’ve made this several times now, one of my new favorites. My question is, is there a good substitute for the aquafaba? Chickpeas are expensive. I’m just wondering if you have to whip the aquafaba before adding it to the mashed banana or not? I assume from your instructions that you do not…by the way you are killing it!!! Your recipes are so great and I love everything I’ve ever made from your site…thanks so much! Thank you Dana – This looks awesome!! This looks great! And not having to clean up a million things sounds perfect for lazy ol’ me. Going to try the recipe soon with my Mum. 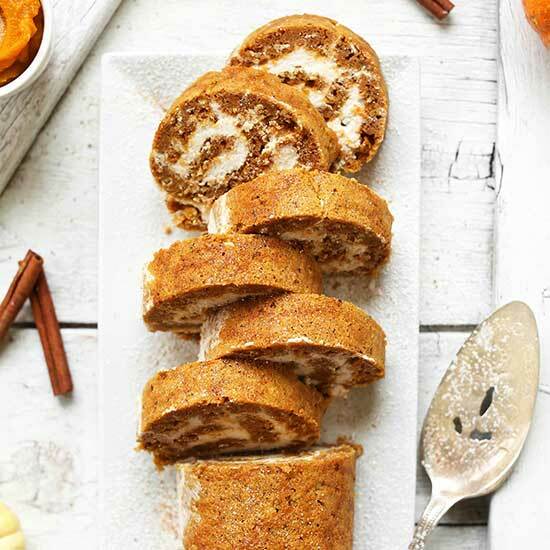 I made this awesome pumpkin roll with all purpose flour instead of almond flour and it worked just the same. I also added a bit of vanilla extract in the cream cheese and it tasted amazing! Thanks! so what did u use instead of gluten free flour? Sounds so delicious and the photos are beautiful, as always! Such a good idea, thanks for sharing! I am so excited! I make your pumpkin muffins all the time! Thank you for your amazing recipies!! What could I sub for the cream cheese? I can’t have the soy. I could try a tangy cashew cheese? I have made your recipe for that as well! You are a lifesaver!!!! I think Daiya cream cheese is soy-free, but you’d have to check to make sure. Kite Hill cream cheese style spread is AMAZING (and soy free!). It’s almond milk based. That’s what I’ll use when I make it tonight! Yay! Hi there! Yes, try a tangy cashew cheese – good luck! This looks so delicious! Pumpkin Roll is one of my family’s FAVORITE thanksgiving desserts, so I’ve been trying to recreate it, but I haven’t had any luck. I got so excited when I saw this post, I can’t wait to make this in a few days! Have you tested this with regular AP flour? We aren’t gluten free, so I think I may just sub AP. I also wonder this, but because many family members have but allergies. If anyone tries this with regular or pastry flour please let us know how it turns out! I there! I haven’t. But I do think that would work! Let us know if you give it a try!